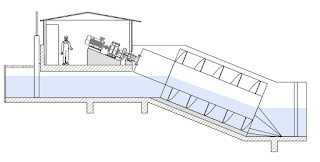 What is an Archimedean Screw Generator (ASG)? An ASG is a positive displacement machine, which consists of a rotor in the shape of an Archimedean screw rotating in a semicircular trough. By filling the buckets of the screw, incoming water provides a tangential force, thus a torque, on the shaft of the turbine. Thanks to its robust design, cheap construction, good efficiency, and tolerance to floating object transit, the ASG is a good solution for low heads and medium discharges. When to use an ASG? An ASG can be used for heads ranging from 1 to 5 m and discharges from 0.5 to 7 m3/s, as depicted by the red line in the picture below. Multiple ASGs are commonly used in side-by-side arrangement in order to increase the plant discharge, up to 30 m3/s (green area in the picture below). How to select an Archimedean Screw Generator in HPP-design? Just create a new sizing, enter a value of net head [H] and maximum discharge [Q] suitable for ASGs (e.g. H=3m, Q=5 m3/s), click “create sizing” and select the icon of the Archimedean Screw. Why it is not possible to select the ASG icon? Why there is more than one possible solution when I select ASG icon? Because the required discharge can be achieved with different numbers of generators. More generators require more space and the cost of the plant is normally higher, nevertheless the single generator will be smaller and easier to transport, plant efficiency higher at partial loads and the maintenance easier. Is the solution that allows minimizing the number of generator in the plant, thus the width and the total cost. Why is there a limit in the maximum discharge of the single Archimedean screw? Because of construction and transportation limits. Moreover, the lower the available head, the lower the maxim discharge per turbine due to aspect ratio constraints. Once I have selected the turbine on the list, are there other possible options? Yes, on the sizing-detail page, you can choose between a fixed-speed and a variable-speed regulation of the turbine. You will see a change in the part load efficiency on the graph. Which turbine should I choose if both Kaplan and ASG are available? What are pro and cons of an ASG as compared to a Kaplan turbine? For heads between 2 and 7m, both a Kaplan turbine and an ASG are available. The first one has a slightly higher efficiency and smaller dimensions. On the other side, ASGs are frequently cheaper (lower CAPEX and OPEX), easier to inspect and allow the transit of debris without the needing of an automatic trash rack. Through HPP-Design you can compare multiple solutions, check the features of each machine and ask for a quotation! What is the expected efficiency of an ASG? Despite its simple construction, an ASG is able to achieve hydraulic efficiencies over 80%. Main losses are related to hydraulic frictions, turbulence at intake and discharge section and water leakages between the screw and the through. Provided that water velocity in the screw is one order of magnitude lower then in reaction turbines, friction losses and kinetic energy loss at discharge are low. How to regulate an ASG? An ASG is rather different from traditional turbines, such as Kaplan, Francis or Pelton, since it is a positive displacement machine. Thus, it is regulated without the need of adjustable blades or gates. 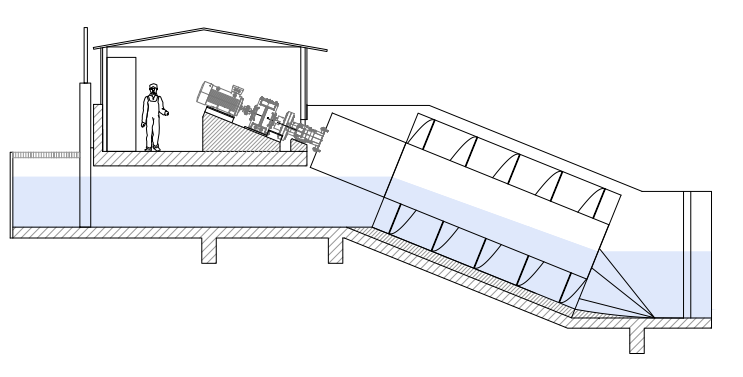 The screw self-adapt to the decreasing flowrate through a lower filling of the buckets and a lower water level at intake section. A speed regulation through an inverter system allows achieving higher efficiencies at partial loads by keeping a constant level at intake section. Although ASG is a relative newcomer to the hydro world, having only arrived on the scene over the last 25 years, they have been around for many centuries as pumps where tens-of-thousands unit have been installed worldwide, particularly in sewage treatment works. The same manufacturers that dominate the pump market are now the main suppliers into the hydropower market as well, providing reliable machines with very low operative costs.